Who is the man who hides his scarred face behind a mask? Hero or madman? Liberator or oppressor? Who is "V" -- and who will join him in his daring plot to destroy the totalitarian regime that dominates his nation? Natalie Portman stars as Evey, a working-class girl who only dreams of domestic bliss and raising a family, but after being figuratively drawn and quartered by the Government, she must determine if her potential savior, V (Hugo Weaving) -- a bold, charismatic freedom fighter driven to exact revenge on those who disfigured him -- has become the very menace he's supposedly fighting against. The authorities are not going to stand by while V plots to start an uprising, and send in Chief Inspector Eric Finch (Stephen Rea) to track down the renegade before civil unrest turns into a full-blown revolution. So goes the story of 'V for Vendetta,' possibly the most politically-charged mainstream film to come out of Hollywood since the genre's golden age of the 1970s. Based on the incendiary graphic novel by Alan Moore, 'V for Vendetta' is a tough film to discuss without revealing its secrets and surprises. Yet it's not very difficult to see parallels between the United States government that ruled at the time Moore wrote the original graphic novel, and today's current political climate. Here is a film that, however slyly and subversively, rips apart the Right and makes no apologies, sticking a swift middle finger right up the arse of the Bush administration. 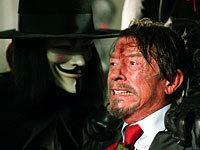 As directed by James McTeigue, 'V for Vendetta' is a film bursting with potential, at turns fascinating and frustrating, with some fantastic scenes and plenty of missed grips on good ideas. 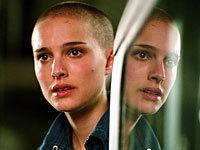 Perhaps McTeigue felt indebted to crib from the Wachowski's 'Matrix' films, for 'V for Vendetta' teeters on the edge of parody with its rigid melodramatic soliloquy/action scene structure. There is a very fine line between using extensive expositional dialogue to reveal the motives of characters and using it to explain their actions, and 'V for Vendetta' often crumbles under the weight of such verbal excess. Such dialogue, of course, was a staple of the 'Matrix' films, which often felt like talky Bergman films with a few action scenes mixed in for good measure -- so much so that some audiences left the theater wondering if they'd seen a sci-fi extravaganza or a political diatribe. 'V for Vendetta' stands uneasily on these wobbly legs, and perhaps a better integration of all the talk and all the action might have made for a more cohesive, emotionally satisfying work. I would never dissuade anyone from seeing 'V for Vendetta,' however. Here is a movie far too ambitious and smart to be discounted for any narrative faults. It is also far more explicit in its sensibilities and confrontational in its stance than any recent "political" movie, outgunning even the passionate 'Syriana,' the sublimely beautiful 'Brokeback Mountain' and, thankfully, that crap piece of hackwork called 'Crash.' It could also be said that the sum of 'V for Vendetta' works better than each of its individual parts. Certainly, by its weak climax (I won't spoil anything for you, but it asks us to swallow some pretty unbelievable character and plot points) I was more affected by the overall nightmare quality of the future it imagined than by what actually happened onscreen. Still, I'd much rather see a film aim high and fail, than have it show no aspirations at all. 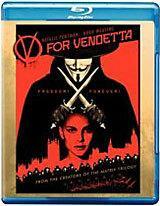 'V for Vendetta' hits Blu-ray a good 18 months after the HD DVD release. That hasn't stopped Warner from reusing the same transfer, so again we get an identical 1080p/VC-1 video transfer. My opinion of the image hasn't shifted from my original review of the HD DVD -- this is a very fine-looking presentation that faithfully reproduces the film's somewhat schizophrenic visual style. It's also not perfect, but contains enough moments of sweetness that it holds up quite well, even against the latest Blu-ray new releases. By contrast, the world of "V" and any shot meant to highlight Natalie Portman's beauty (which wouldn't be hard) can be scrumptious. Colors are more robust but still clean, and Portman's camera-ready features are always a lovely shade of orange. I also got off on the way the rich crimson of the Government's Nazi-esque iconography clashes in a positive way with the rest of the image, yet noise and compression artifacts are never a problem. Detail and depth to the image are also significantly improved here. Given the film's intended visual excesses, 'V for Vendetta' is a four-star transfer. Not content to merely recycle the video, Warner also regurgitates the Dolby TrueHD 5.1 Surround track (48kHz/16-bit) from the previous HD DVD. Sadly, I was never that wowed by the audio on the original HD DVD, so this ranks as one of the lesser TrueHD tracks I've heard on Blu-ray (at least thus far). First off, the biggest problem with the previous DVD release has been fixed here. Gone are most of the poorly balanced volume levels, with dialogue now more prominent in the mix, and no longer overwhelmed by the effects. This is doubly important in 'V for Vendetta,' as the film is so full of long, pontificating speeches and intricate monologues. Also boosted is dynamic range. Fine sonic details are more audible in the mix in Dolby TrueHD, such as the flap of V's cape or foley effects as innocuous as footsteps. In fact, clarity and attention to detail are occasionally truly amazing. Low end, too, is boosted and delivers some serious rumbling during the film's otherwise lackluster action scenes. Surround use is less aggressive, however, and I wasn't quite as blown away by the intensity of the rear channels as I hoped. Certainly, there are some nice uses of discrete sounds and near-transparent imaging to create a very involving soundfield, but this is no 'Batman Begins.' There are also no issues with the source, or other deficiencies. I still am not blown away by this TrueHD track, but it still sounds pretty good. Featurette: "Freedom! Forever! : Making 'V for Vendetta" (SD, 16 minutes) - Kicking things off is "Freedom! Forever!" offers a good quick overview of the movie from graphic novel through production. All the expected participants are here via on-set interviews and making-of footage, including director James McTeigue, Natalie Portman, Hugo Weaving and producer Joel Silver. Only the Wachowski Brothers are nowhere to be found, but given their very low public profiles, that's no surprise. Featurette: "Remember, Remember: Guy Fawkes and the Gunpowder Plot" (SD, 10 minutes) - Thankfully, we get more than just one decent if clearly promotional featurette. This is absolutely essential viewing for a movie like this, especially for the uninitiated. Though some of the academics interviewed for the piece are a bit dry, I was surprised at the viciousness that continues to be directed at Fawkes, if only because it is startling that a holiday exists solely to burn Fawkes in effigy and celebrate his demise. Some of the film's English cast members also offer their thoughts on this piece of their history, one still largely unknown to us Stateside citizens. Featurette: "England Prevails: V for Vendetta and the New Wave in Comics" (SD, 15 minutes) - As much about the evolution of '80s comics into what have become more literary-minded (and respected) "graphic novels" as it is specifically about 'V for Vendetta.' Which is probably a good thing, as Alan Moore, who created the original graphic novel, has disowned the film. There is some detail here on the changes made (for better or worse) to Moore's original vision, though some is already pretty obvious just by watching the movie. I hoped for a bit more of an edge to this one, given the controversy surrounding the film adaptation, but this is still important to watch if you want to truly understand the story's translation to the big screen. Featurette: "Designing the Near Future" (SD, 17 minutes) - At first, this seemed anticlimactic -- yet another making-of on a film's production design? But 'V for Vendetta' is one good-looking movie, and it is genuinely fascinating how they transformed modern Berlin into a retro-futuristic London. Right down to the most minute details, such as the individual props in characters' homes. Pretty cool stuff, actually. "Cat Power" Montage (SD, 4 minutes) - Essentially a makeshift music video for the film's end credits tune. "Saturday Night Live" Digital Short Parody (SD, 4 minutes) - This "Saturday Night Live" parody (made famous after becoming a YouTube sensation) is absolutely hilarious -- you'll never look at Natalie Portman the same way again. Theatrical Trailer (SD) - A 16:9 widescreen (but not high-def) trailer for the film is included. 'V for Vendetta' is an exciting, incendiary film that's brimming with passion and idealism. Unfortunately, it's also a bit of a dramatic mess and viscerally muted. Still, I'm glad filmmakers are beginning to embrace politics once again in mainstream cinema -- and loudly. This long-awaited Blu-ray release comes off just as strong as the now two-year-old HD DVD, with a very good transfer, pretty good Dolby TrueHD track, and solid supplements, including a BonusView-enabled "In-Movie Experience" track. 'V for Vendetta' is certainly recommended.